Piermont is a village on the west bank of the Hudson River in Orangetown. 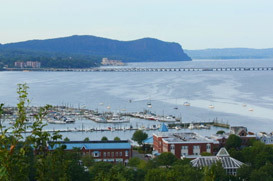 Some refer to this quaint little town as “Hollywood on the Hudson.” Again, Piermont shares in the best school district, South Orangetown Schools, and is in close proximity to New York City (less than 30 minutes). As a prime place for outdoor recreation, Piermont is home to two parks of interest. Eleanor Stroud Park, a small pond and park, is great for picnicking and in the wintertime, ice-skating. Another popular recreation spot is Tallman Mountain State Park, located over the century-old hand-cranked drawbridge, which features trails for hiking, walking, cross-country skiing, tennis courts, a pool, spots for picnicking and a playfield. If that’s not enough, rent a boat from Paradise Canoe & Kayak and navigate through the bird sanctuary of the Piermont marsh. For those who prefer fine dining indoors, Piermont has a wide variety of some of New York’s top restaurants such as Freelance Café and the five star Xaviers, owned by Iron Chef winner Peter Xavier Kelly. For a quick bite, Canzona’s Market provides sandwiches and salads, while Bunbury’s is a cozy little coffee and pastry shop. You may see Lance Armstrong having a coffee and croissant after a long bike ride from New York City .For international flavor, Café Portofino and Confetti Ristorante are two excellent Italian destinations while Sidewalk Bistro serves authentic French cuisine. Don’t forget to catch a music legend at The Turning Point, one of the oldest and most famous live music venues in town. For more dining options and local activities, be sure to visit our Dining, Leisure & Life page.